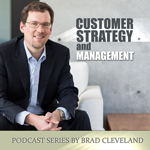 If you haven’t listened before, you might want to check out my podcast series “Customer Strategy and Management.” It includes short, to-the-point podcasts on topics such as building profitable customer relationships, customer access strategies, contact center value, and customer service through social media. This entry was posted in Call Center, Contact Center, Customer Access Strategy, Customer Experience, Customer Relationships, Customer Service, Leadership, Mobile, Podcasts, Social Media and tagged Brad Cleveland, Call Center, Call Center Management On Fast Forward, Contact Center, customer experience, customer relationships, Customer Service, podcasts, service operation, Social Media, strategy by Brad Cleveland. Bookmark the permalink.